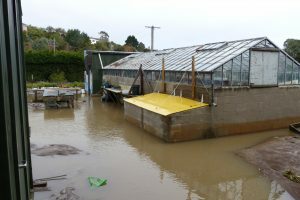 The Trust’s nursery was severely damaged in the June 2015 floods that devastated the lower parts of South Dunedin. They called it a “one in one hundred year” flood; about two months’ worth of rain fell in 24 hours during 3rd and 4th June, flooding hundreds of homes and shops. 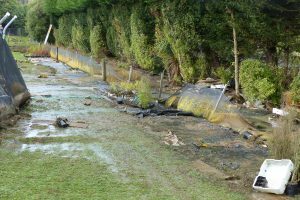 The creek, running down a gully on the top side of the property we lease from the Dunedin City Council, filled with debris from further up the hill, and eventually breached its banks. A torrent flowed through our nurtured plants and buildings and, out to the other side of the property, down the road and into the sea at Company Bay itself. It left plants buried, sometimes under half a metre of silt, others washed into the ocean 500m away; seedlings entirely covered in silt no longer recognisable; labels washed from most plants so no longer did we know their provenance; plants no longer in their containers but twisted and knotted in fences and boundary hedge; the access road gouged out and footpaths all but washed away. In one road hole we even had kōkopu, a native fish, swimming! 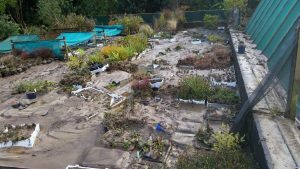 Many of the plants lost or damaged were ready to go into penguin habitats over the winter, the seedlings were to become next year’s plants. 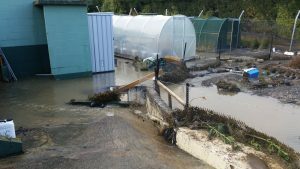 And so to the clean-up – firstly the site was checked for any contamination, being a decommissioned sewage treatment plant, followed by plumbing and drainage checks, and finally ensuring all electrical connections were safe. And then the real work got under way. Delta was contracted to use their earthmoving machinery to remove silt and repair much of the infrastructure. Teams of willing and eager volunteers removed yet more of the silt, washed plants, salvaged other parts of the infrastructure, sorted the plants and pots, gathered the rubbish and tidied up the grounds. Along the way, the Trust Board made a strategic decision to downsize plant propagation to only that required for our own needs and some other local projects. We had been growing plants for both our own needs and for associate groups’ own coastal projects. Production has now been set at 5,000 per annum, the number we believe we can easily both plant and maintain each year. There was unanimous agreement that our eco-sourcing policy should not be compromised by planting any trees and shrubs of unknown ecological origin into any Trust reserves. Today when visiting the Nursery, you would hardly be aware of what happened back in June 2015. There remains debris some in netting and, some plants are still being unearthed from those tiny hiding places, but generally we are fully operational and a functioning Nursery once more. The Trust is indebted to many for their assistance over these months. Businesses, associates, groups and individuals all gave willingly and supported us in practical tasks, written support, and even hugs and welcome cups of coffee. A huge thanks to each and every one for helping us through this difficult time.